Next up in the OJFTMHYLW list is seaweed. But..why not call it sea vegetables? Weed sounds so unappetizing, so unwanted. Yet, seaweed is a terrific food. There are many kinds of seaweed commonly consumed in Japan, and all are quite low in calories, contain many minerals, and are high in fiber. The only problem for a lot of people is that seaweed has a distinctive texture and flavor. Wakame, which often appears in salads, as garnish for sashimi, and in miso soup, has a rather slimy texture which just gets more slimy the longer it's soaked. If you can get used to this all the better of course. But if not, there are ways to get around this. First, try chopping it up very finely and sneaking it into food. Second, if you put it into soup (like for miso soup) the sliminess, which is actually a form of fiber, will melt into the liquid and be less noticeable. Also, sautéing in oil, or mixing with an acid like vinegar, counteracts the sliminess. Kombu seaweed is most commonly used to make dashi stock, but it can also be eaten. The best way to eat kombu is to chop it up very finely unless you develop a liking for the leathery texture. You can also find kombu-cha, kombu tea, which is dried, salted and flavored pieces of kombu steeped in water. Kanten, or agar-agar, is a coagulant extracted from a seaweed called amakusa. It's used like gelatin, but it has slightly different coagulation properties, and is all-vegetable of course. 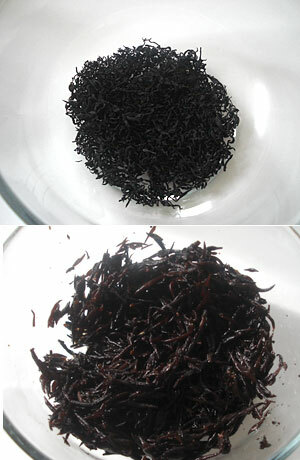 Then there is hijiki, which may be the most versatile seaweed of all. It's also extremely high in fiber - about 40% of it in dried form is fiber. Hijiki is not commonly seen on the menus of Japanese restaurants since it's used mostly for homely home cooking. It comes in dried form, as do most other seaweeds (except for salted 'fresh' wakame). It's usually soaked for about an hour beforehand, then rinsed, before use, If you're in a hurry though you can blanch it for a couple of minutes in boiling water, which hydrates it quite fast. Hijiki when reconstituted swells to about 5 times its original weight, so don't use too much! A serving is usually 1 or two tablespoons worth at most. Hijiki comes in two forms mostly: regular hijiki, which is rather twig-like in dried form, and me hijiki, small buds of hijiki that looks like black tea in dried form. 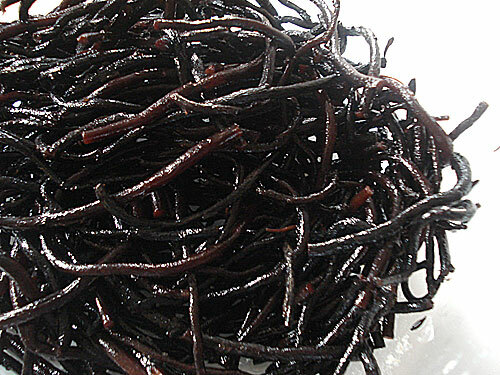 Once regular hijiki is reconstituted, it looks like long black noodles. Star Trek fans may see a remarkable similarity to gagh. However hijiki does not move on your plate or have feet. The traditional way to cook hijiki is to stew it in dashi stock flavored with soy sauce and often sugar, together with vegetables like carrot or lotus root, or fried tofu (aburaage). Since it's fairly neutral in flavor, it can be used in salads, or stir fries and such. There is just one caveat about hijiki. Four countries have issued warnings, but no outright bans, for hijiki, citing its more than accepted levels of inorganic arsenic. It should be noted that the initial tests on hijiki which lead to those warnings in the UK among other places was based on testing the dried, un-soaked hijiki - and you never eat hijiki that way. Soaking reduces the amount of trace arsenic by 1/7th; rinsing and cooking it in liquid further reduces it. The report here (Japanese) by the Tokyo Health and Welfare Department states that as long as a person weighing 50kg (about 110lb) does not eat more than 5 servings of hijiki of 5g dry weight per serving (which swells up to a lot more than that when soaked) that it is perfectly safe, even for pregnant women. In any case you should not consume large quantities of this or any other food (it's actually very hard, if not impossible, to eat a huge amount of hijiki) and it's often recommended to eat it with vegetables which may help to eliminate the inorganic arsenic from the body efficiently. Pre-soaking it and rinsing it before eating, which is the traditional way to prepare it, eliminates much of the arsenic content also. Recipe: Hijiki and vegetable "Napolitan"
This is a non-traditional way of cooking hijiki, though note that the hijiki is still soaked, rinsed and stewed and eaten with vegetables. It adds fiber, flavor and interesting color to a pasta dish that's inspired by "Spaghetti Napolitan", a common item served in Japanese family-style restaurants and such, that has nothing at all as far as I can tell with Naples. It has tons of vegetables and a little bit of ham, which can be left out to make this a vegetarian/vegan dish. This yields 4 generous and very filling servings. Soak the hijiki, drain and rinse following the directions above. Heat up a pot of water to boil the pasta. Slice the vegetables thinly. Chop the garlic finely. Cut the ham into strips. While you boil the pasta, heat up a sauté pan or wok. Put in the can of tomatoes and the vegetables. Simmer until the vegetables are soft and the moisture is almost gone. Add the oil and ham and hijiki and sauté briefly. Add the tomato paste and Worcestershire sauce. Season if needed with salt and pepper. Drain the pasta and add to the pan, stir around to coat the strands well. Serve immediately, optionally topped with some freshly grated Parmesan cheese. Don't just settle for commercial furikake that's often loaded with MSG and other dubious ingredients. Furikake is quite easy to make at home, with only the things you want in it. This furikake, which is just bursting with umami, can be made with any seaweed you like, or a mixture. Be sure to chop up the seaweed finely. This is most easily accomplished in a food processor, but you can chop by hand too. This one has a mixture of me-hikiji and nori. Chirimenjako is small, salted whole fish - you can find this or something similar in most Japanese, Korean or Chinese groceries. You can leave it out if tiny whole fish bother you. About 3-4 Tbs. of reconstituted, rinsed and drained me-hijiki, wakame, kombu etc. 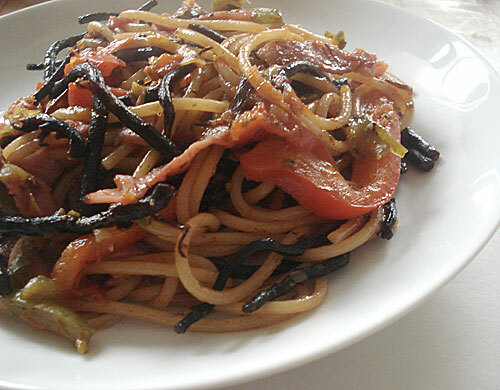 Put the moist seaweed and the chirimenjako in a non-stick frying pan over medium heat. Stir around until it's dried out quite a bit and is getting a bit crispy but not burnt. Add the soy sauce, the bonito flakes, and the shredded nori, and continue stirring until it's almost dry. Add the sesame seeds, citrus rind and red pepper, and stir until the sesame seeds are popping. Take off the heat. Store in an airtight container in the refrigerator, and try to use it up within a week. I find the information about seaweed in English to be rather spotty, so I've drawn most of my information from Japanese sites. The British find inorganic arsenic in hijiki! on About.co.jp (Japanese). Notes that soaking hijiki lessened the amount of arsenic to 1/7th, according to the British study. A statement on hijiki (English, PDF), from a U.K. natural food seller. Submitted by maki on 2007-01-17 19:23. It's spelled Inari. That should help. I really don't know what those are Molly...maybe the spelling is wrong or different from what I know. I lived in Japan for a while and my boyfried is Japanese(I am Italian. Japanese food is really tasty, even for someone who is used to an Italian diet like me. I had to learn to use all these japanese ingredient in ordewr to cook for my boyfriend and i also learned from his mother. If you have any question, please feel free to write to me. I have also some "criss cross" hybrid Western-Japanese recepies which are acceptable by both cultures. I want to make a recipe for my mother with kantan. It is something red and sweet my grandmother made which was similar to jello, but more firm. I found the kantan, but do not know the other ingredients. My family is japanese. I have looked on line and cant find a recipe. help. [quote=Tess Dunlap]I want to make a recipe for my mother with kantan. It is something red and sweet my grandmother made which was similar to jello, but more firm. I found the kantan, but do not know the other ingredients. My family is japanese. I have looked on line and cant find a recipe. help. Wash kanten and tear it into small pieces into a bowl full of water. Squeeze out the water. Put kanten and 10 ounces of water in a pan and cook over low heat until the kanten is melted. Add the can of cooked beans to the kanten and pour into mold. Chill until it is set. Remove kanten from mold and cut into squares. Soak azuki beans overnight in lots of water. Cook beans in the same water until beans are tender. Remove excess water from cooked beans and add enough water to make 6 cups. Soak dried kuri overnight, too. Rinse kanten, squeeze out water, tear in pieces and boil in the 6 cups of bean water until kanten melts. Strain this mixture with a sieve. Combine all ingredients and boil on high for 45 minutes, stirring constantly to prevent scorching. Pour into pan, cool and refrigerate. The white stuff is basically a natural coating that appears when the konbu is dried, it's full of flavor. If you see any grit on the surface you should wipe it off, but otherwise use konbu as-is. Hi, I'm trying to figure out which seaweed is found in the typical seaweed salad I get at Japanese restaurants in the US, can you help?? Hello maki I was wondering what does OJFTMHYLW means..I hope you dont mind explaining ! Sea vegetables are underrated. Over in Northern Ireland,dulse is still dried and sold in my home town of Ballycastle,especially at the Lammas Fair where you get a little paper bag of it to eat as-is. Very few people over in England wanted to try it when I brought some over,though few can appreciate the combination of salt,chewiness then sweetness. I love seaweed!my family worked and spent many years in Japan,now I'm married to a japanese(I'm spanish-german) and living in Hong Kong we're lucky enough to find all kind of japanese products over here. I think I have almost every day a small portion of wakame tofu salad...with japanese dressings sooo goood!!! I love your site,thanks Maki! Can you tell me the name in Japanese of the purple ingredient used in small cut maki rolls with three colored ingredients? There seems to be a traditional combination of vegetable sushi with three colors: yellow (takuan), green (cucumber), and this mysterious purple sour stuff. I asked once and the lady said it was some kind of pickled wakame...? What is its name, and is it used for other dishes? It is delicious! Shibazuki is used widely in Japanese cuisine, and in bento, you'll often be served it in a little bowl to go with your food, and many times this will be served alongside a small portion of takuan and cucumber. Perhaps someone at the restaurant you visited thought they should keep this trio of tsukemono favourites together and roll them up in rice and nori. I like Nori,my turtles love any kind of seaweed and it is a great food source during these times when you can not go out in the pasture and weed some greens for them. My kitties love nori seaweed. Coincidentally, one of them is named Nori. do they all come as a dried form? Or can you get them fresh? You may be able to get 'fresh' wakame preserved in salt. All other seaweed types are sold as dried only, even in Japan. Oh man, wakame!!! I decided to try seaweed and (not knowing any better) I got some dried wakame. I tried soaking it...it made my whole kitchen smell like back bay! YUCK! I tried eating it, and...well...it tasted like it smelled. So I'm wondering...how the heck do you make this stuff edible? I've had it, and it was good, so I know it can be done. Help? I've been looking around for Hijiki in Sydney, only to find out it's been band by the local officials around 6 years ago... It was rather sad. I wish I could get hold of some. Hi, I just discovered seaweed in a funny way. I had a hair dye disaster and had to grow out my hair and read that seaweed helps. Now my hair is natural again and silkier than ever, and I still eat seaweed every day. It's sold at Whole Foods and other health food stores. I was at the Dublin airport and saw kombu and spaghetti seaweed at one shop so I bought the spaghetti seaweed and it was pretty good but I have to mix it with pasta to eat it. My favorites are dulse and nori, which I eat as a snack. Dulse tastes like bacon and I tried adding dulse flakes to soups and beans but it made everything smell like seaweed although it added a nice salty flavor. Wakame is too slimy for me but it's good in miso soup. I added wakami to beans and it made them really thick and tasty, and not slimy at all. 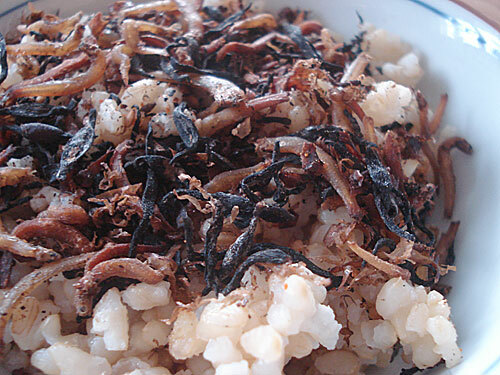 I made Hijiki with rice and couldn't really taste the hijiki at all. For some reason I can't get the nerve to try kombu. seaweeds help or or there any books that could explain in simple detail. Hi Maki, thanks for the great post. Just a note, on the hijiki I bought in the UK (from Clearspring), the health warning is about iodine, not arsenic, and it suggests not to consume more than 5g (dry weight) per week. Can agar-agar be used as a thickener for hor soup instead of starch? If so what quantities should be used? I was totally unaware about this ingredient. I would have tried this in many of my dishes if I had known about it before. Anyways thanks a lot sharing this information. This will surely help me in future. Keep sharing.